What am I? 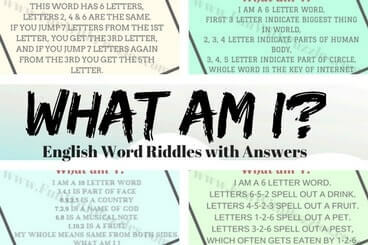 word riddles are very interesting English word puzzles. In these word puzzles, your challenge is to guess the English word and some hints will be given which relates to the combinations letters of the given word. These hints related to the different English words created using combinations of letters the the given big word. In these word riddles your challenge is to guess the English Word. You will be given number of letters in the word. In additions, you will be given hints which relates to the different combinations of the letters of the this given word. 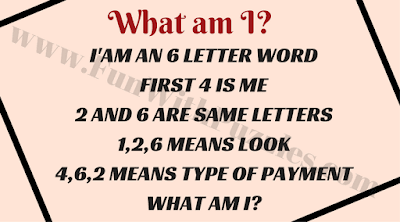 Lets see how quickly you can guess the words in this "What am I?" Quiz? 1. Can you guess "What am I"? 2. Can you find "What am I"? 3. Find "What am I?" in this word riddle. 4. Can you find "What am I"? 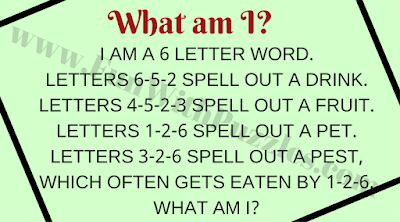 in this word riddle? 1. 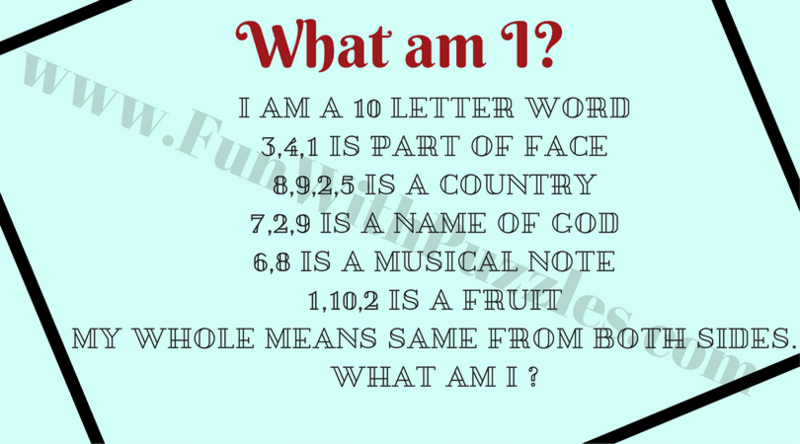 Fun Brain Teasers For Kids, Teens and Adults with Answers to Challenge your Mind: There are mix of Word riddles, Mathematical Brain Teasers and Logical Puzzles. 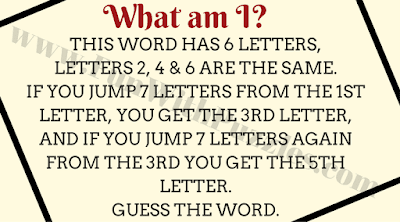 This is most liked puzzles on this website. 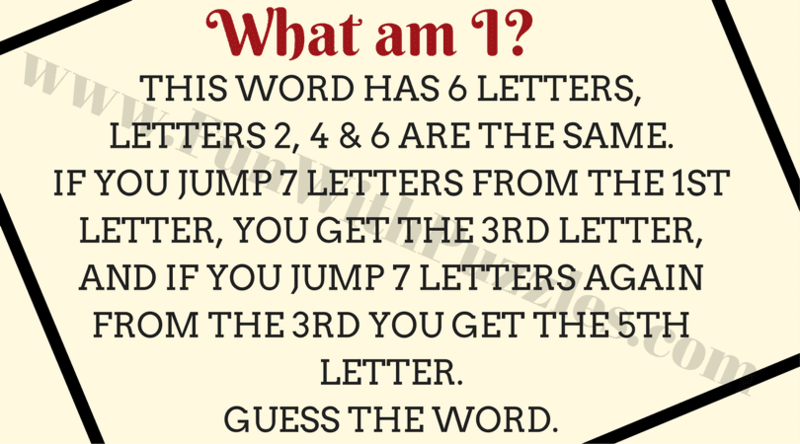 Do explore these puzzles to twist your mind. 2. English Word Puzzles for students with answers: These are fun English Word Puzzles in which some hints regarding the English word and your challenge is to guess this word. 3. Hidden Meaning Word Puzzles with Answers: These are Rebus Puzzles in which one has to guess the hidden meaning represented by the picture puzzle image. 4. 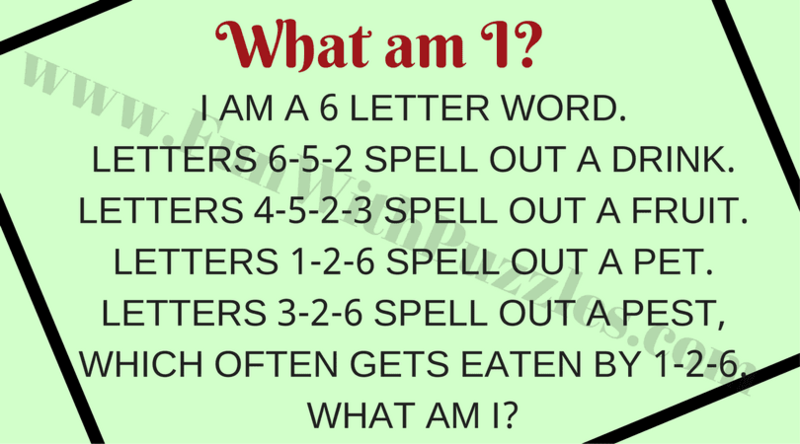 English Word Brainteasers with Answers to Test your Mind: These are the word brainteasers which will twist your mind. In these word riddles you will be given hints regarding the English words and you have to guess the word.